(Orlando, Florida) – The unique 1793 Wreath U.S. large cent variety (Sheldon NC-5, Crosby 10-F) in the collection of the American Numismatic Society (ANS) has been authenticated and graded by Professional Coin Grading Service as PCGS AU-58. The coin has a distinguished pedigree dating back to 1881, but this was the first time it has been formally certified by a third-party grading service. "PCGS experts examined this amazing coin and encapsulated it at the Florida United Numismatists (FUN) convention in Orlando, Florida, on dealer set-up day, January 7, 2009. It was truly awe-inspiring to see it in person," said Don Willis, President of PCGS, a division of Collectors Universe, Inc. (NASDAQ: CLCT). After certification by PCGS, the coin was placed on display at the FUN convention booth of early American copper specialists, Chris McCawley and Bob Grellman, alongside selected highlights from the large cent collection of Daniel W. Holmes, Jr., an ANS Trustee. It was the first time the coin has been publicly seen outside New York City since it was donated to ANS 63 years ago. "The Trustees of the Society have loaned this coin to fellow Trustee Dan Holmes. We are very excited to have for the first time a display of a complete set of all large cent varieties. We hope many people see this exceptional display," said Dr. Ute Wartenberg Kagan, ANS Executive Director. The Holmes Collection will be offered in a series of auctions by McCawley and Grellman through Ira and Larry Goldberg Coins and Collectibles in Beverly Hills, California, beginning September 6, 2009. "Many of the most important pieces in the Holmes collection have been certified and graded by PCGS, and are labeled with the Holmes pedigree on each holder," said Larry Goldberg. The 1793 Wreath cent with the vine and bars edge was delivered by armored car service from ANS in New York City to Orlando on Wednesday, January 7, where Grellman took possession and brought it to Willis for certification and grading by PCGS. "We wanted to encapsulate the coin for security and protection purposes," said Grellman. The unique coin was donated to the ANS in 1946 by prominent collector George H. Clapp of Pittsburgh, Pennsylvania, one of the founders of ALCOA (Aluminum Company of America). "The pedigree is a virtual who’s who of late 19th and early 20th century U.S. numismatics," added Willis. The earliest-known owner of the coin was New York dealer Edouard Frossard who discovered the variety in 1881. In his December 8, 1881 sale catalog, he described the coin as: "1793 Wreath Cent. Stem of sprig rises between the 7 and 9 of the date, the leaves slender and spreading. Rev. The same as rev. of last number: a combination mentioned neither by Levick and Crosby, nor Frossard. Unique. A splendid impression, proof surfaces." Later owners included Lorin G. Parmelee, Dr. Thomas Hall, Virgil Brand, and Burdette G. Johnson of St. Louis Stamp & Coin Co. who sold the coin to Clapp for $600 in 1942. Clapp donated it to ANS four years later, and it has been in the society’s collection ever since. On September 7, 2009, the day after the auction of the Holmes collection, the Goldbergs will offer Part Three, the "late dates," of the Ted Naftzger collection of large cents. The nearly 700 coins in the collection now are in the process of being examined, certified and graded by PCGS. 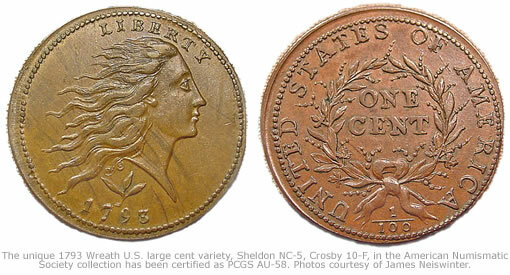 The Goldbergs’ earlier auction of PCGS-certified "early date" coins from the Naftzger collection set record prices. For additional information about PCGS, call (800) 477-8848 or visit online at www.PCGS.com. For additional information about the American Numismatic Society, call (212) 571-4470 or www.numismatics.org. For information about the Holmes Collection auctions, contact McCawley & Grellman, (972) 668-1575 or (407) 682-9592 or www.MandGauctions.com, or Ira & Larry Goldberg Coins & Collectibles, (310) 551-2646 or www.GoldbergCoins.com.